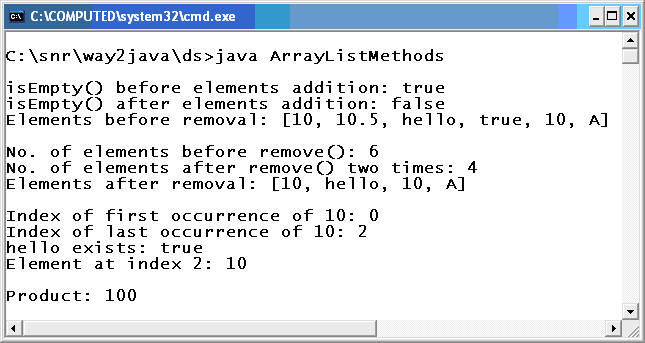 Note: Before going throuhg this "ArrayList Example Methods Java", it is adivised to read first ArrayList Introduction where all the methods, class signature, constructors and history are given. A non-generic (stores heterogeneous elements) ArrayList object al1 is created and checked for its emptiness with isEmpty(). This method returns true if no elements exist in the ArrayList, else false. The above statement returns true as still elements are not added to ArrayList. Later, with add() method elements are added. The remove() method is overloaded that takes index number (as int) as parameter and also the name (as object) of the element. As two times the remove() method is called, the size (number of elements present) will be decreased by 2. Observe the screenshot. Observe, the element 10 is added twice as ArrayList accepts duplicates. Its index number is retrieved using indexOf() and lastIndexOf() methods as in String. The contains() method returns true if the element exist, else false. The get() method, inherited from List interface, returns the element in object of Object class form. For printing it is okay, but object cannot be used in arithmetic operations. For this, the object must be converted into primitive data type form; this is what is done in the above code. Object obj is explicitly type casted to Integer class and from Integer, int value is obtained with intValue() method. A beginner should be acquainted with this type of conversions and are discussed elaborately in wrapper classes. What is the problem with this conversition sir it is giving an error? ?